The point of home decor is not only create a daily living space full with aesthetically pleasing but also creating more cheerful ambience for you and your family members. A home that reflects your aspirations of aesthetics would give you a cozy space to unwind your stresses of the day. Decorating a living room could make gathering more intimate while beautifying a dining room would enchant delightful when having meals. Home decor encompasses many different elements apart from aesthetics for each and every corner in a house. It also involves space utilization of a room and functionality of home accessories that being used inside the room. Don’t to worry. Home decor is not complicated task as long as your decorating stuffs carry both of beauty and comfort elements. 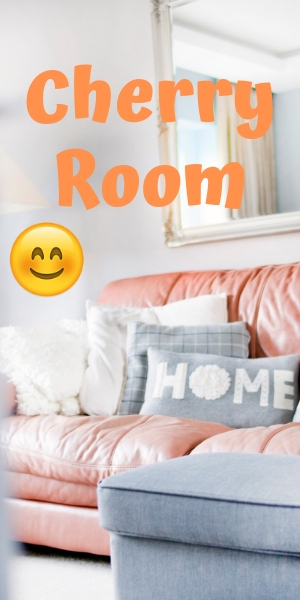 Let’s grab similar home accessories recommended here and putting these decorating ideas to the test in your house; you’re sure to enjoy a stylish home that’s full with cozy and joyful atmosphere. When a holiday is coming upon us, most of us are busy to decorate our home in order to embrace holiday spirit. It is time to enjoy cheery moments with family members and friends. 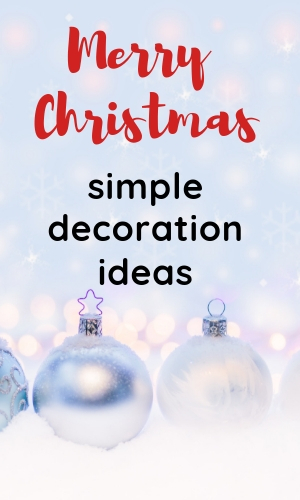 Stay on and scroll down if you are looking some simple ways to make your home festive instantly. It’s all about spooky! Some people go all out to embrace this holiday. They turn their garage into haunted house or setup graveyard scene at their front patio. All in all, they are decorating their house with spirit of “festival of the dead”. If you have kids at home and would like to leave joyful memorable times of trick or treat for little ones, then put aside those creepy props. You may make use orange color while decorating your house. Carving pumpkin or make use of blow-up props are ideal pick if you are looking for kids-friendly Halloween decorating ideas. Let’s start from a boring bathroom. Could you imagine a person’s reaction when she or he sees bloody hand-prints and blood splatters all over in a bathroom? You probably will hear a loud scream sound. You probably will hear a loud scream sound right after your guest steps in the bathroom. You don’t need to require the whole noon time during weekend to set out such horror scene. All you need is to find ready-made bloody handprint shower curtain and blood splatter bath mat. Click the link to see the bathroom accessories that feature variety bloody styles. I personally love this kind of decoration stuffs. They not only act as props to freak out guests but also practical supplies that people need to use in bathroom. In case you don’t want to decorate your bathroom as murder scene, you may consider witches brew shower curtain or other ghoulish Halloween shower curtain sets. Off course, you need to pick different pattern of Halloween bathroom rug to match them. Next is the kitchen decoration. The common activities that people do in a kitchen include preparing breakfast, cooking dinner, sharpen blades so that easy to cut and slice food. Did you ever think of using fake food to scare your guests? Yes, you get me right. You can display fake human heart or Halloween decorations body parts which being packed in a normal shallow meat tray on countertop. You can also add severed head props that associate with a victim being chopped into few pieces. This kind of horror scene definitely boosts spooky touch to the max level. If you dislike creating such spooky feeling in your kitchen, you may replace with giant spider Halloween prop sticks on kitchen door or flying witch Halloween prop hangs on wall. This type of props is not as creepy as fake body parts but they feature the classic festival icon that adds touch of holiday spirit. You can use these props to decorate your living room as well. Living room is the main place to serve guests. You can create a spooky yet fun feeling by displaying some motion activated Halloween props that full with art of surprise. Do not hesitate to take advantage of a black and white plastic table cloth for creating a foundation of centerpiece in the living room. Some table clothes come with spider designs which is best suited as October festival decoration. Similarly, you can place a black table runner on dining table. You’ll find variety pattern designs such as skull, ghosts, whimsical pumpkin, spider and cobweb. Feel free to pick one that matches your decoration theme. 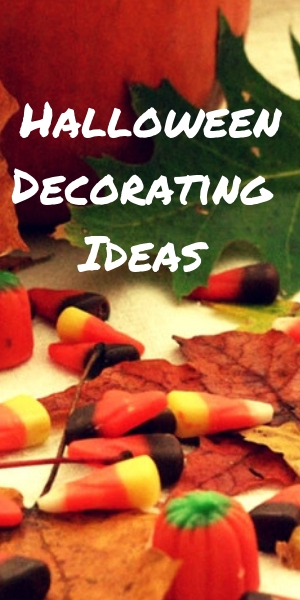 Once you have a table runner, you can place an animated Halloween candy bowl on dining table. This kind of sweets container will surprise kids at the moment their hand reach out the bowl. I always like to kick off the outdoor decoration from main door by simply hang a black and white wreath or light up Halloween wreath. My favorite choice is the one features classic icons and illuminate at night. The design may include a little skull, ghosts or the word BOO. This is the simplest way to add the holiday atmosphere. Next, it’s garage. Please don’t get me wrong. I am very seldom to decorate garage room as it is not the place I serve my guests. What I mean is to utilize Halloween garage door magnets that having the greeting word “Happy Halloween” for adding touch of holiday excitement. I then move on to setup a spooky landscape that surely attracts every single passerby at night with my secret tool. Guess what secret tool that I am using for the past few years? Bingo! It is Halloween light show projector that helps me to setup a very charming yet vivid scene instantly. If you go all out for this October festival, you won’t miss the yard decorations. To be honest, this is the area that makes me headache each year. This is because it expose to everyone; neighbors, guests and even a passing by stranger. I used to decorate my front yard with scary theme before we moved here. There was a year I utilize life size Halloween coffin matches with a life size posable skeleton and an animated zombie ground breaker prop to decorate that area as graveyard. It really was a fun experience and some of my neighbors was copied my ideas and done the similar decoration on the following year. Anyhow, I personally found that it is not suitable if there are toddlers stay nearby. Yes, I do considering the neighborhood when come to outdoor decorating and this cause me think twice before decide a decoration theme. I finally pick inflatable ornaments as it is the best suited as kids-friendly Halloween decoration for front yard. Most of them come with whimsical designs such as inflatable witch legs. Alternative you can pick blow up witch to add spooky touch but it does not frighten little trick-or-treaters. Talking about little trick-or-treaters, you may prepare light up Halloween buckets for your young kids. It is adorable container that kids love to carry on the night of 31 October. You probably notice that I utilize a number of props to complete the holiday decoration. Well, this is the simplest and easiest way to decorating from indoor to outdoor at home when conjunction with busy work schedule. When step in the mid of November, we are planning to decorate our home from yard, hallway, living room, kitchen to home office. This is a joyful holiday and we wish to boost Christmas atmosphere at every corner. A Christmas tree definitely is the main character. We have one which bought ever since we moved in new house and keep inside store room for the past few months. Now is time to show off the tall Xmas tree by hanging shiny ball ornament and some other eye-catching decorative little stuff. Each and every year, our indoor Christmas decoration starts from Xmas tree. This year we buy a new burlap Christmas tree skirt to match our brown color wooden floor. When the artificial Christmas tree is completed setup and stand in front of us, it’s time to adorn it and turn it an eye-catching piece. We said bye to ordinary star tree topper and replace it with Santa Christmas tree topper. We grab a super adorable tree topper last week. It features a Santa Claus who wears his classic costume and has a gift sack on his back is climbing down thru chimney. Last few years, we used ball ornaments for body part. This year we have extra nutcracker ballet Christmas ornaments hanging in between ball shape trinkets. We then have a life size nutcracker statue stands next to the Christmas tree. It is staring at decoration of an animated Santa climbing a red ladder by carrying a string of LED lights. The animated Santa even plays different Christmas chorus while he is climbing up and down. Last but not least, we put light up Christmas presents on tree skit surrounding the Xmas tree to complete the decoration. The present boxes feature red color ribbon and snowflakes. They all create an amazing scene for letting us embrace the excitement of holiday. They all create an amazing scene for letting us embrace the excitement of holiday. Did I mention where is the place we setup Christmas tree? We have it stand next to our main door. After passing thru entry way and turn right, guests would reach our living room. So, living room is our next decoration area. My super simple approach to decorate living room is to buy few Christmas decorative pillow covers for replacing the current ordinary pillow cases. If you have no throw pillows on sofa, you may consider grab red and white Christmas pillows to boost holiday spirit instantly. There is a charming tabletop fiber optic Christmas tree on side table next to sofa. My son likes to turn off the living room light in order to see beautiful lights that keep changing colors from the tips of the pine needles. Off course we never forget to put something on coffee table as it is part of decoration in our living room. We either display a winter country cabin sculpture or snow globe. It depends on what type of throw pillow we put on sofa. If we are using reversible sequin holiday throw pillow, then we will mostly choose Santa musical water globe. We also take curtain color into consideration. As we had been hanging Christmas curtain that features green fir branches with pendent red balls, we want those decorative items match the color of curtain so that it creates a harmony scene at the same time increase the holiday ambience. If living room is busy corner for serving guests, then kitchen is another heavy duty area for our own uses. Thus, we adorn kitchen window by apply climbing Santa Claus pendent ornaments. You’ll embrace holiday mood when you step in kitchen and see those adorable Santa Claus climbing a rope. On top of that, we have some practical decorative stuffs placing on countertop such as Christmas paper towel holder, red and white kitchen towel to be used as dishcloth as well as Christmas wine bottle holder. You may consider decorate wine bottle with Christmas jumper or Santa cover in case you just have one or two wines bottles in kitchen. Among all those decorative practical stuffs, my most favorite item is salt and pepper set that featuring an adorable Santa looking a mail box. In fact, I have few sets of Christmas salt and pepper shakers that I collected throughout the years. They all made with ceramic and feature eye-catching design. Next area is bathroom. The easy way to decorate bathroom is changing the existing curtain with Christmas shower curtain and towel. To complete the bathroom holiday decoration, place similar design of Christmas bathroom rug set that include toilet lid cover, toilet floor contour as well as the floor mat. I also apply the simple decoration in home office by putting a light up nativity set on my working desk whereby my son is putting a wooden tabletop Christmas tree. Before we move to outdoor decoration, we had hanged a Christmas wreath with battery operated lights on top of main door. We also decorated mantelpiece by hanging Christmas stocking with letters. We used to have decorative holiday cover on garage door. And so, we purchased garage door Christmas cover that featuring 3D effect with winter design to replace the Halloween one. We then apply the same thing to mail box by having a magnetic mailbox cover. During day time, the attractive landscape at our front yard is white nativity scene that we setup last week. We found that some passerby slow down their steps just because they want to have closer look of the holly family scene. Last year we have Mickey Mouse inflatable decoration and adorned the scene with solar light stakes surrounding it. Due to the weather here, those solar lights may not function at night as they supposed to. Anyhow, they look nice as part of decoration at front yard. Light show projector never brings us down when comes to night time of holiday season. We always setup the projector a week before the festival and definitely activate it on party night.